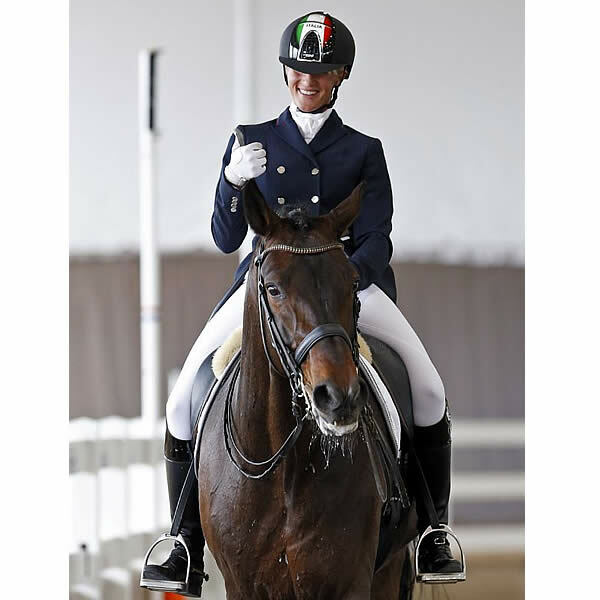 Wellington, FL – February 15, 2013 – As Italian dressage star Silvia Rizzo wraps up her impressive South Florida debut, the combination of high-level competitive opportunities and a friendly, supportive atmosphere at shows has her already looking forward to next year. The proximity to the beach doesn’t hurt either, and Rizzo has been taking in the Florida attractions between shows and training sessions on the striking Oldenburg stallion Donnerbube 2. The balance of hard work and a little relaxation seems to be working, as Rizzo and “Bubi” have put in some of their best performances to date. “I’ve broken three of my personal records here: Grand Prix score in a 5*, Grand Prix Special score in a 5*, and Kür score in a World Cup event,” Rizzo said. “Bubi loves it here,” she added, explaining that he enjoys the quiet atmosphere where he is stalled at the Jim Brandon Equestrian Center in Palm Beach County. Along with Rizzo, Bubi has become a fan favorite and regularly poses for photos with his admirers. Rizzo has put together a series of steadily improving performances in Grand Prix competition. Most recently, she and Bubi took seventh in the Grand Prix on a sweltering hot day at the Wellington Classic Dressage Spring Challenge CDI3* (Feb. 8-10), and then put all the pieces together for a standout third-place effort in the Grand Prix Freestyle. Other season highlights include top scores and a fifth place finish in the Grand Prix Freestyle at the World Dressage Masters CDI5* Palm Beach, along with seventh place finishes at the Wellington Dressage CDI-W and Gold Coast Opener CDI-W.
Rizzo’s success in Florida has helped her move up the Reem Acra FEI World Cup Dressage Standings. Her 23 points place her 15th in the competitive Western European League. Michele Betti, Rizzo’s partner and the former chef d’equipe for the Italian eventing team, noted that the number and proximity of competitions in South Florida make it an appealing destination for European competitors, who often have to travel long distances between competitions. Spectators charmed by Rizzo’s bubbly personality, as well as those who haven’t yet seen the fashionable blonde in action, will be happy to hear that she plans to set up shop in South Florida for several months next year. She will bring several horses from Hof Marabunta, her base in Germany, to train and compete. Rizzo and Betti, an accomplished eventing and show jumping trainer, both look forward to taking on American students, who will benefit from the pair’s expertise and international experience. To see an exclusive interview with Sidelines TV, visit http://www.youtube.com/watch?v=kQ47JJA6BOk. To follow Rizzo on the road to August’s ECCO FEI European Dressage Championships in Denmark, follow Hof Marabunta on Facebook: https://www.facebook.com/pages/HOF-MARABUNTA/163706307019334?fref=ts. For more information about Silvia Rizzo and Hof Marabunta, go to www.hofmarabunta.com.